Recently Haiti President Michel Martelly celebrated his third year in office. He gained wide support from the U.S. on his election platform which persists as his administration’s slogan: “Haiti is open for business.” Three days after his inauguration, Martelly landed at Île à Vache’s Abaka Bay resort and extended an offer of one million dollars to become 51% shareholder to then-owner Robert Dietrich. Tourism is a leading industry in the Caribbean. Two models predominate, an upscale “all-inclusive” or a “spring break,” “anything goes” model. While these tourist models may increase foreign exchange, these models also rendered many landless, degraded local environments, and triggered conflicts. While foreign owners gain a lot of wealth, many workers receive miniscule minimum salaries. This has been evidenced by the recent struggles by factory workers in Haiti. Trying to promote “responsible tourism” is the focus of a summit in July in Grenada. The Haitian government is presenting the “Tourism Destination Île à Vache” project as one such positive model. 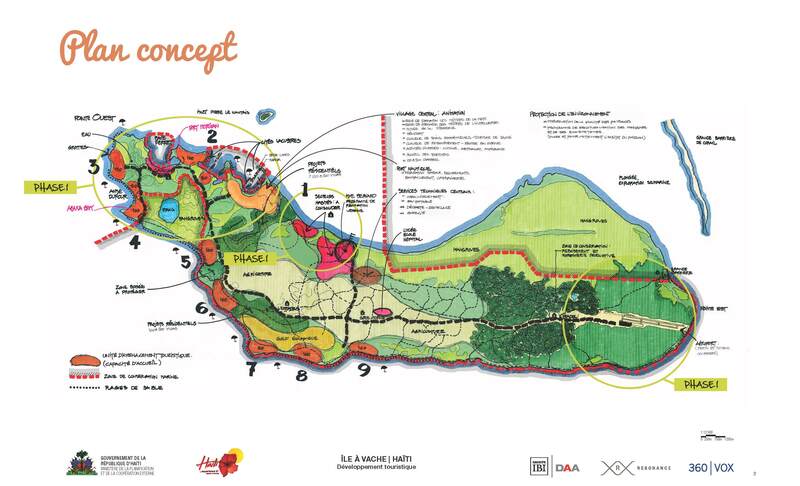 Minister of Tourism Stephanie Balmir Villedrouin and many other officials have reported to the press and other international audiences that the population of Île à Vache is largely in support of this development project. If this holds true, then why have thousands mobilized in several protests with some individuals engaging in direct action? And what are viable and responsible solutions? This Thursday, May 29, representatives of the Haitian government met with human rights organizations who had published an April report, to attempt to answer these questions. According to a government representative who attended this meeting, Secretary of State for Plant Production, Fresner Dorcin, reported that he felt his life was in danger as people threw rocks at him during a visit to the island. On a March 1 visit, Minister of Tourism Villedrouin requested that the population stop protesting and send petitions instead. This official stated that a small group of people have been manipulating the population against the project. Two religious leaders, including the head of the Catholic parish and a Canadian nun who has been on Île à Vache since 1981, are equally concerned about the government’s proposal. Residents’ concerns about the plan do not stop at the lack of information. On May 10, 2013, Le Moniteur, the official journal of the government published a decree declaring the island a tourist area and private property not recognized. Residents understand that this decree signed by President Martelly, Prime Minister Lamothe and other government officials leaves them vulnerable to exploitation, especially in a process in which they have not been invited to participate. There are significant environmental concerns. In a country with only an estimated two percent of its original forest cover, Île à Vache contains a large old-growth forest. On August 20, 2013, ground was broken on a new international airport, on this site. Thousands of trees would be cut down to construct the road to the airstrip. That same day, Martelly-appointed interim Mayor Fritz Cesare issued an additional decree forbidding any personal construction without prior authorization. Clear demands have been made for information but instead the government has responded by sending riot police to quell dissent. On February 25, when citizens peacefully protested the arrest ofJean Matelnus Lamy, riot police shot live ammunition. Twelve people were injured and two others arrested. Other incidences of physical intimidation occurred when blockades were set up earlier in the month. Also, KOPI member Kenold Alexis’s house was ransacked by the island’s mayor and CIMO (riot police). Alexis went to the justice of the peace, who handwrote a declaration of loss of 20,000 gourdes, around $450. Similarly, in the evening of March 26, 2014, crews of Dominican company Ingeneria Estrella ripped through several areas to build a road without warning. Some of the residents lost as many as 18 coconut trees affecting the livelihood of families according to KOPI spokesperson and director of the high school Feores Jeanty. Several individuals stated that they are not opposed to the road since it would facilitate smoother transport of commerce and emergency medical transport. The problems are there is no hospital on the island and compensation for losses required by sections 36.1 and 36.2 of Haiti’s constitution have been nullified by the May 10 decree. Article 2030 of Haiti’s Civil Code guarantees the right of ownership if an individual has paid rent on the land for ten years. After 20 years of occupancy whether or not rent has been paid, the parcel is granted to the individual or family. So according to Haitian law 102-year-old Isanne Aregran, who was born in her current home, should be secure. Residents are not necessarily opposed to “development” or tourism. Instead, they are deeply concerned that they will be stripped of their land and no longer have access to the waters in which they fish. Fishing and agriculture are the primary economic engines which the plan appears to threaten. The inhabitants, especially peasants, underscore the importance of agriculture for their livelihood and the country’s real development. Like the Free Trade Zone on the border with the Dominican Republic, the Caracol industrial park, and mining in the North; Île à Vache is considered very productive agricultural land. For all its displacement and $22 million price tag, only 2,590 people worked in Caracol by the end of 2013. Stripping peasants of their rights to their land and production is a direct affront to Haiti’s food sovereignty. Île à Vache is not alone: on the mainland, hundreds of peasants in Picot are threatened with forced eviction and loss of livelihood to pave the way for a new international airstrip for Aux Cayes’ airport. Both top-down development projects violate the Food and Agricultural Organization Voluntary Guidelines on the Responsible Governance of Tenure. Mark Schuller is professor of anthropology and NGO Leadership and Development at Northern Illinois University.